For years, we had thought that our luxuriant-looking plant was a Hosta. Its beautiful and large heart-shaped lime-green leaves are such a wonderful sight for sore-eyes and provide added greenery at our courtyard, delighting us so! More amazing was it flowered for the first time after seven years of tender loving care. 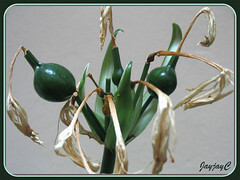 We were fascinated with their blooming that eventually set 2 glossy dark-green seed pods. We’d like to experiment germinating them but don’t know when to harvest their seeds as the pods seem to be forever in dark green and not turning brown at all. My first request for our plant’s ID was to Royal Horticultural Society, UK but unsuccessful as I was a non-member. 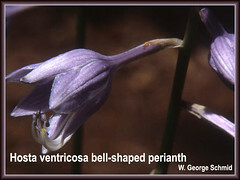 Next try was an email to W. George Schmid who authored Hosta Species Update to get his expertise. 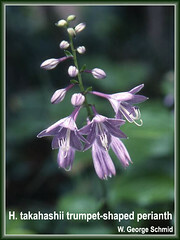 I came across his amazingly informative and educative site while researching to write about Hostas. Haha, guess what…we’ve been barking up the wrong tree!! Our plant is definitely NOT A HOSTA as confirmed by the esteemed author and plant taxonomist. We were momentarily stupefied…for so long, we had thought it was one! His analysis was very comprehensive and educative. We’re touched by his kindness and willingness in sharing his knowledge and expertise, as well as suggesting an alternative local source for our plant’s ID search. Your submission of pictures is quite interesting. Unfortunately, I cannot ID this plant as being a hosta. While its leaves are very, very close to the morphology of a hosta leaf, the other pictures prove without doubt that this is NOT a hosta. The key identifiers for flowering plants is always the flower and its morphology. 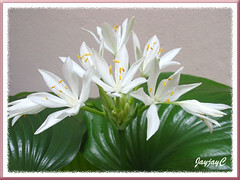 If the flowers are not in accordance with the morphology for the genus Hosta (and they are NOT) this plant cannot represent a member of the genus Hosta. The leaves are very similar to hosta leaves, but that similarity is not a decisive morphological factor. Hostas have a racemose inflorescence (see picture 1 phoenix flowers) – your plant has an umbellate inflorescence, not a racemose one. 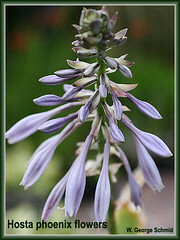 Hosta flowers have a narrow tubular section (tubus angustus) that is formed by the lower portion of 6 sepals joined to form a tube. This is followed by a central, expanding section that can be trumpet-shaped or bell-shaped, followed by the exterior lobal section, which forms the separated tips of the perianth (see picture 2 (bell-shaped) and 3 (trumpet-shaped)) – your plant has six separate tepals that are not fused into a tube at the tubus angustus and are in fact not fused at all, but free. 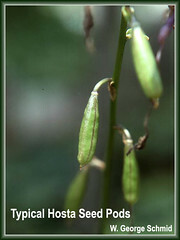 Hostas have a pendular seed pod, with roundish or three-sided cross section. Average size is 25-36 mm long and 3-4 mm in thickness.The seed capsule is three-chambered with each chamber having a double row of black, winged seeds. The capsule dries up and splits into three sections and releasing the seeds, usually around the first frost or freeze or before going dormant. The color is green to green with purple dotting (see picture 4) – your plant has a large, round, dark green seed capsule that is reminiscent of those seen in Amaryllidaceae. The seed pods of your plant have erect stems and are arranged in umbellar fashion, just as the flowers. This has never been seen in Hosta. Unfortunately, my expertise as a taxonomist is not with tropical/subtropical monocots and I cannot definitively determine, which species your plant belongs to, but I can assure you it is not a hosta. 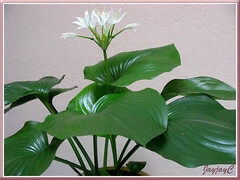 Hostas are not native in tropical/subtropical areas of the Earth. Using your garden location in Kuala Lumpur, Malaysia, I find that your climate is listed as tropical with annual southwest (April to October) and northeast (October to February) monsoons seasons. While hostas would certainly like the moisture, they would not like the heat. Here in North America, we cannot grow hostas in the semi-tropical areas of our southeastern states and in Florida. Hostas need a mandatory dormancy period, something no plant would experience in your climate. To me it is amazing to see the leaves on your plant being so similar to hosta leaves that just seeing the leaves alone might have certainly convinced me they are hosta leaves. By the way, your photography is excellent. Perhaps you can submit these detailed photographs together with my analysis to one of your unversities or botanical gardens. May I suggest your outstanding Forest of Knowledge garden, Rimba Ilmu, which is located in the University of Malaya campus. It emphasizes the flora of the Malaysian and Indonesian region and they should have information on your plant. I would be very much interested in finding out to what species your plant belongs. This garden also has an Tropical Environmental Education Program and will hopefully help you in your search for ID of your plant. Feel free to show my analysis and pictures at Rimba Ilmu. Yesterday, we followed through with George’s helpful suggestion and forwarded our enquiry (together with his analysis and pics) to the officer-in-charge of Rimba Ilmu Botanic Garden, Institute of Biological Sciences, Faculty of Science, University of Malaya. We’d like to express our heartfelt gratitude and appreciation to Mr. W. George Schmid of Hosta Hill Research Garden, Georgia, USA and Mr. Sugumaran of Rimba Ilmu Botanic Garden (UM), Kuala Lumpur, Malaysia for their prompt replies and kind assistance in solving our plant’s identity. Thank you so very much and may God bless you both abundantly always. Update: August 5 2009 – Some plant info on Proiphys amboinensis.